Commonly referred to as Lisbon's Overseas War (Guerra do Ultramar) or in the former colonies, the War of Liberation (Guerra de Libertação), these struggles played a seminal role in ending white rule in Southern Africa. Though hardly on the scale of hostilities being fought in South East Asia, the casualty count by the time a military coup d'état took place in Lisbon in April 1974 was significant. It was certainly enough to cause Portugal to call a halt to violence and pull all its troops back to the Metropolis. Ultimately, Lisbon was to move out of Africa altogether, when hundreds of thousands of Portuguese nationals returned to Europe, the majority having left everything they owned behind. Independence for all the former colonies, including the Atlantic islands, followed soon afterwards. Lisbon ruled its African territories for more than five centuries, not always undisputed by its black and mestizo subjects, but effectively enough to create a lasting Lusitanian tradition. That imprint is indelible and remains engraved in language, social mores and cultural traditions that sometimes have more in common with Europe than with Africa. Today, most of the newspapers in Luanda, Maputo - formerly Lourenco Marques - and Bissau are in Portuguese, as is the language taught in their schools and used by their respective representatives in international bodies to which they all subscribe. Indeed, on a recent visit to Central Mozambique in 2013, a youthful member of the American Peace Corps told this author that despite having been embroiled in conflict with the Portuguese for many years in the 1960s and 1970s, he found the local people with whom he came into contact inordinately fond of their erstwhile 'colonial overlords'. 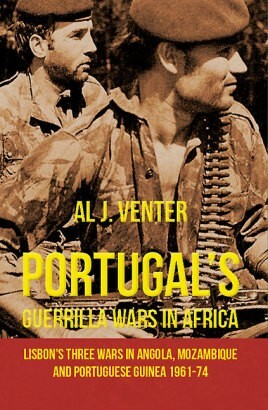 As a foreign correspondent, Al Venter covered all three wars over more than a decade, spending lengthy periods in the territories while going on operations with the Portuguese army, marines and air force. In the process he wrote several books on these conflicts, including a report on the conflict in Portuguese Guinea for the Munger Africana Library of the California Institute of Technology. Portugal's Guerrilla Wars in Africa represents an amalgam of these efforts. At the same time, this book is not an official history, but rather a journalist's perspective of military events as viewed by somebody who has made a career of reporting on overseas wars, Africa's especially. Venter's camera was always at hand; most of the images used between these covers are his. His approach is both intrusive and personal and he would like to believe that he has managed to record for posterity a tiny but vital segment of African history. Al J. Venter is a specialist military writer and has had 50 books published. He started his career with Geneva’s Interavia Group, then owners of International Defence Review, to cover military developments in the Middle East and Africa. Venter has been writing on these and related issues such as guerrilla warfare, insurgency, the Middle East and conflict in general for half a century. He was involved with Jane’s Information Group for more than 30 years and was a stringer for the BBC, NBC News (New York) as well as London’s _Daily Express_ and _Sunday Express_. He branched into television work in the early 1980s and produced more than 100 documentaries, many of which were internationally flighted. His one-hour film, _Africa’s Killing Fields_ (on the Ugandan civil war), was shown nationwide in the United States on the PBS network. Other films include an hour-long programme on the fifth anniversary of the Soviet invasion of Afghanistan, as well as _AIDS: The African Connection_, nominated for China’s Pink Magnolia Award. His last major book was _Portugal’s Guerrilla Wars in Africa_, nominated in 2013 for New York’s Arthur Goodzeit military history book award. It has gone into three editions, including translation into Portuguese.